There are many adjectives I would use to describe working in the marketing industry. Rewarding, challenging and highly competitive come to mind. One thing for certain is it’s never boring! Marketers are not tasked with maintaining status quo; they are expected to drive growth, and innovation is a key tenet of the marketing gospel. In addition, marketers must advertise where consumers view media. Newspaper, radio, television, mail, Internet, social media… the list of media channels funded or at least subsidized by marketing dollars will certainly continue to grow. Marketers are always drawn to what is new, emerging or “trending.” In theory, the benefits are two-fold. The first benefit is the ability to leverage a new way to speak to customers and prospects. The second comes from being viewed as an innovative organization by always being on the leading edge of new technology. But it’s always surprising when we talk with some of the most sophisticated marketers in the world and they describe how disconnected their digital and direct mail efforts are for acquisition marketing. Each has an impact on the other’s results, but there seems to be little urgency to define what that impact is or how to optimize it. However, too much focus on emerging channels – the bright shiny objects – can lead to a loss of focus on what’s really cool – Return on Marketing Investment (ROMI). Today’s sophisticated direct mail has it in spades, particularly when used in conjunction with digital channels. For marketers to get the results they desire, they won’t want to lose sight of the power of direct mail. It should remain an integral part of their media mix. The impact of direct mail on other channels is often discounted or minimized. SEO and paid search are lower sales funnel tactics and it’s often mail or other media that first drove the prospect into the funnel. Making a lower funnel tactic pay off requires effective use of an upper funnel tactic like direct mail. It’s important to measure the impact of direct mail on digital and develop strategies around content, creative and/or cadence to optimize that impact. The handling of the USPS pension funding debacle has cast an unfair perception on direct mail’s long term viability. While the steady drumbeat of seemingly annual postage hikes have given marketers good reason to look to other channels, mail is still the dominate channel for acquisition in direct marketing, by a wide margin. The credibility and trust of mail is often discounted. The risk to peoples’ personal information online and a slew of email fraud has created a very high bar to gain consumers’ trust. Continuity between direct mail, digital and other higher funnel media can help overcome some of these concerns. Of course, results are the only thing that matter to all media related acquisition marketing efforts, and the focus should be on lead generation. Emerging media may or may not provide adequate results as a lead generation tool. 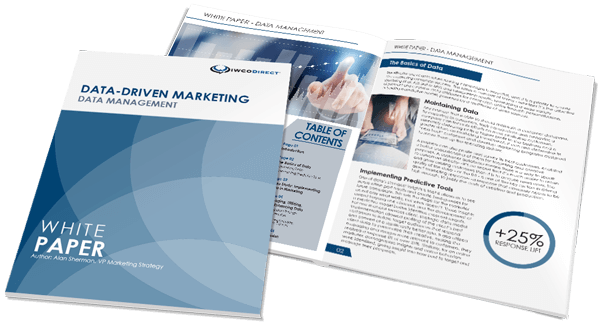 Sophisticated testing strategies and appropriate attribution methods will have to be employed to optimize how these channels interact with direct mail to maximize the number of leads generated. IWCO Direct is eager to help our customers learn how best to optimize all established media channels as well as define the impact of those that are emerging.